Many towns and cities in Illinois have laws called “crime free” or “nuisance” property ordinances that punish landlords and tenants based on the need for police or other emergency services at a property. This can happen even when the tenant was the victim of the crime or called the police for protection. No one should have to choose between keeping their home and calling the police for help. Research in other states has shown that these ordinances are disproportionately enforced against survivors of domestic violence who seek police protection. Individuals with disabilities and others who need emergency services are also harmed by laws like these. These ordinances may violate the First Amendment right to petition the government, due process guarantees, and federal and state prohibitions against housing discrimination. In response to these concerns, Illinois recently passed a state statute to protect survivors of domestic or sexual violence and individuals with disabilities from being penalized as a result of calls to the police for help. The new state law says that tenants and landlords who are penalized or threatened with penalties because domestic or sexual violence has occurred at their property, or because of a need for police or emergency assistance as a result of a disability, can ask the courts for help. The ACLU of Illinois is working to inform tenants and landlords of their rights, and to make sure that local governments know that these types of penalties cannot be enforced under the new law. Have you been unfairly threatened with eviction or a fine because a call to police or arrest happened at your home or on your property? Share your story. Kankakee Daily Journal: Are 'quality of life' laws unfair to victims? 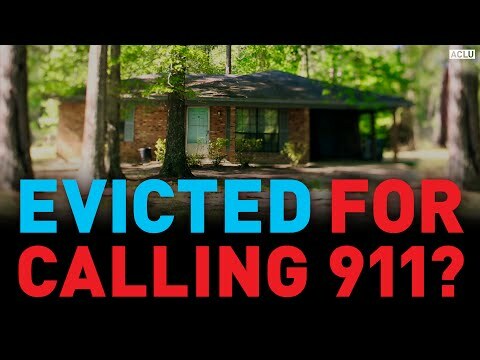 Evicted or Fined for Calling 911?